This is an immaculate and spacious 3 bedroom home set in desirable village location. Cosy in winter with under floor heating & log burner, a delight in the summer, with tri-fold doors leading from the 39ft open plan living space opening onto decking and the beautifully landscaped cottage gardens designed and created by the current owner. Tucked to the rear via a gated driveway is the Oak beamed double garage & ample parking, and fields behind. Churston village offers a rural style of living yet is less than five minutes drive from the centre of Brixham, and about ten minutes drive from the centre of Paignton. The River Dart and Kingswear are also easily reached. Churston still retains its sleepy village atmosphere, with the nearby Churston Manor Inn and adjacent parish Church, dating from Norman times, just a short stroll down the road. "The Grove" offers a peaceful walk through Churston woods down to the sea at Churston Cove and onwards into Brixham. Churston Golf links are just around the corner, and a short walk across the course leads down to Elberry Cove and Broadsands beach. 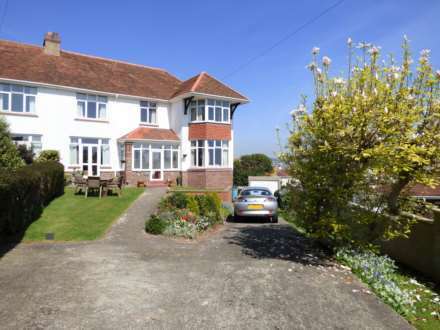 Nearby Galmpton Village has an excellent Primary school and Churston Grammar school is within walking distance, situated right next to the historic Churston Station steam train railway line. Galmpton village also provides a hairdressers, local butcher and post office/general store. Accessed via covered storm porch. Large under stairs storage cupboard with fitted shelving. Stairs to first floor. Contemporary 3 pane glazed oak finish doors to both kitchen and to living room. Smoke detector. Under floor heating. The open plan living space really is a wow room and is accessed through contemporary oak and glazed doors leading off the entrance hallway. This superb room comprises of sitting, dining and kitchen areas and ideal for entertaining but equally for cosy nights in. This space is approximately 39ft long with tri-fold fully glazed doors opening onto the private decked terrace and rear garden. A truly lovely light area which is enhanced by two sky lights as well as the tri-fold fully glazed doors which open onto the rear southerly facing decked terrace and garden. There is ample space to provide a dining area as well as a lovely sitting area. TV aerial point, up lighters. Under floor heating. To add to this special room is a wood burning stove which is set in a recessed chimney breast with oak beamed lintel and slate hearth which just adds a lovely character feature to this superb room. Extensively fitted with a cottage style finish set beneath Granite Resin work surfaces with complimentary Granite Resin splash backs. The base units incorporate a range of drawer and cupboard space with carousel corner units. Built in fridge/freezer, dishwasher and washer dryer also a 5 ring gas Leisure Range Cooker with double oven plus oven/grill. Inset Belfast sink with mixer tap. Matching wall mounted cabinets including display unit and plate rack also two glazed fronted units, under pelmet lighting. Central island and breakfast bar with wine rack and drawer space with Beech wood work surface.LED down lighters. Oak wood flooring with under floor heating. Access to roof space via pull down ladder, partial boarding with light. Also houses gas fired central heating boiler. Large over stairs storage cupboard with shelving and radiator. Walk in double shower with thermostatically controlled shower, wash hand basin, low level WC with dual flush. LED down lighters, extractor fan. Chrome heated towel ladder. Complimentary tiled walls and flooring. Overlooks the front garden. Radiator. Built in range of fitted wardrobe units to one wall with sliding doors and fitted with shelving and hanging space. Currently fitted with shelving and desk space, currently used as on office by the owner. Laminate flooring. Pleasant outlook to the rear and surrounding rural area. Radiator. White suite comprising of panelled bath with shower attachment over, low level dual flush WC with concealed cistern, wash hand basin set in vanity unit with cupboards beneath and shelf. Extractor fan. Heated chrome towel ladder. Complimentary tiled walls and flooring. Obscure glazed window to the front. LED down lighting. The garden to the front is enclosed by a low stone wall roadside and fencing to reflect the village setting of this very pretty location. Pathway to front door which is bordered by attractive rockery style borders created by the current owner to bring all year round colour to the garden. Bin store and cold water tap. The garden to the rear is SOUTHERLY facing and has a good size private covered decked area with LED lighting and power. Steps rise to a further paved patio area opening onto to a beautiful cottage style garden again created by the current owner to provide colour all year round with many varieties of shrubs and bushes. The rear gate opens onto your own PARKING AREA for 2 vehicles. With the benefit of a DOUBLE GARAGE with electric up and over, electric power points, lighting, cold water tap and there is eaves storage plus a good size work bench all fitted in. The parking and the garage are accessed via a private shared gated gravel driveway, which runs by two small paddock areas plus further fields to the rear of the garages all of which provides a haven for wild life and many species of birds.